Not to be confused with Star World. 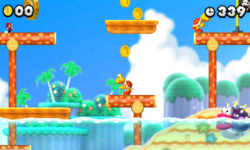 World Star is the third special world and the ninth and final world that appears in New Super Mario Bros. 2. It has nine levels and a hidden Toad House. 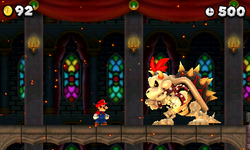 There are seven numbered levels, a rainbow level, and a castle that has Dry Bowser as the boss. 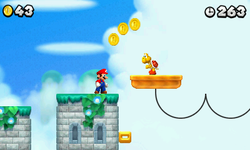 Blocking the levels in the world is a Star Coin Sign, which requires 90 Star Coins in order to open the path. Also at the beginning of the world is a Toad House, which will appear after all Star Coins have been found. 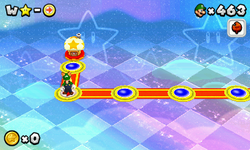 It is blocked by another sign that requires nine Star Coins to remove it, and it gives the player a Super Star for their item slot. Unlike World Mushroom and World Flower, this world is unlocked after defeating Bowser rather than via cannons, much like how World 9 and World S are unlocked upon defeating the final bosses of their respective games. World Star is further differentiated from the first eight worlds in that it has Moon Coins instead of Star Coins. 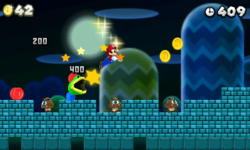 Collecting all of the Moon Coins adds a star to the player's file. 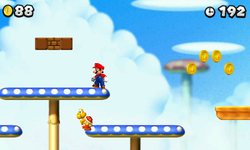 Additionally, finding all of the Moon and Star Coins without using White Raccoon Mario results in the Toad Houses permanently staying in their positions without disappearing. World Star - The World Star Rainbow Course. World Star -1 This level takes place at night. 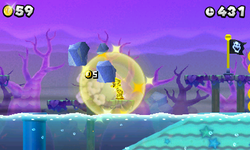 It consists of many Brick Blocks which if the player has a Gold Flower can become a lot of coins. World Star -2 This level takes place high in the sky, on top of what is supposed to be a deserted castle. World Star -3 This rather short level's theme is a combination of a beach and Ghost House theme. World Star -4 This is an auto-scrolling beach-themed level. World Star -5 This level combines the elements of grass and sky. 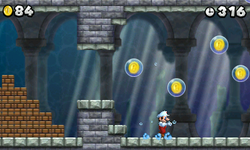 World Star -6 Most of this level takes place in an underwater fortress. 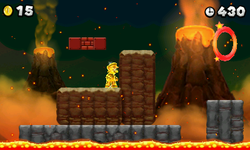 World Star -7 The level is a volcano level and is very similar to World 6-1. World Star - The final Castle of the game. During both Mario's and Gold Mario's Eagle animations in Mario Golf: World Tour, in which they gain invincibility and go on an enemy rampage, the current scenery of the game is changed to that of World Star. 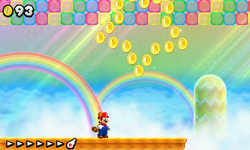 As it could be previously seen in New Super Mario Bros. 2, it features the same vast checkerboard floor that fades into cosmic oblivion, with Super Star graphic patterns vaulting the horizon. This page was last edited on January 5, 2018, at 21:54.